The First Congregational Church of Western Springs, is a historic church designed by George Grant Elmslie, and was founded in 1887. It is considered the finest example of Gothic Revival and Prairie School design in town. Gothic elements included a cruciform floor plan and stained glass windows from the Temple Art Glass Company of Chicago. Prairie elements include a horizontal emphasis, wood ornamentation, earth tones, and use of natural materials. Emil Zettler was commissioned to carve statues and provide decorative elements. Later, Herbert and William Brand designed an addition north of the Education Building in 1959. The church was surveyed during the Illinois Historic Structures Survey and, on August 8, 2006, was recognized by the National Park Service with a listing on the National Register of Historic Places. Marion, has an on-going relationship with this facility consisting of a sanctuary, rectory, and portions of an education building – ranging from historic to modern in construction. 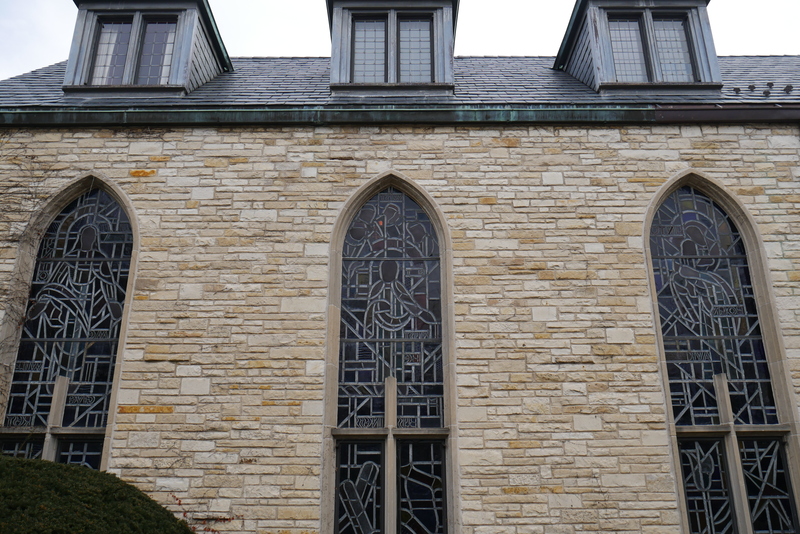 In spring of 2012, Marion began assisting the facility with the recreation of the original sanctuary east and west elevation Gothic arch stone window mullions. These mullions will be returned to their original configuration based upon the historic drawings and historic photographs. This is one reason historic conservation expertise is so important in these projects. 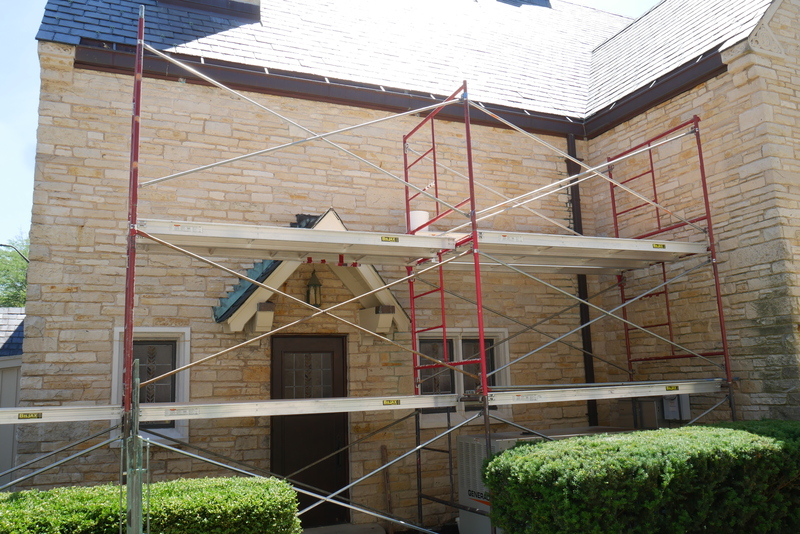 Past projects at the facility include statue conservation and replication at the rectory south entrance, stone repair on the sanctuary and rectory, parapet repair, cleaning, and extensive mortar repointing. Marion executed a facility Condition Assessment in 2010 in order to access current masonry conditions, identify maintenance priorities, and generate opinions of cost. Other than that, Marion Restoration has completed several projects. 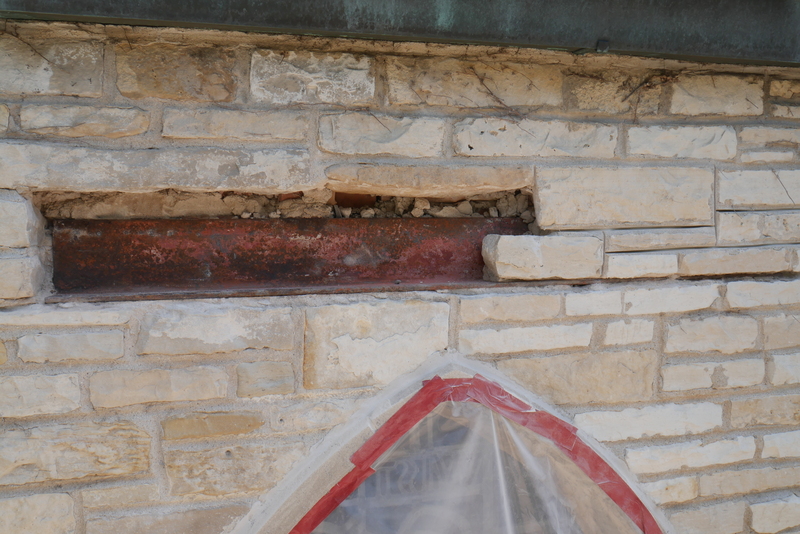 Mortar joints at the chimney on the west elevation of the school had become deteriorated. If we left it as it was then moisture would soon be able to infiltrate the chimney cavity causing moisture damage on the interior and exterior of the chimney, as well as below the chimney in the wall. To prevent exponential future damage we have repointed at chimney on western elevation of education building. 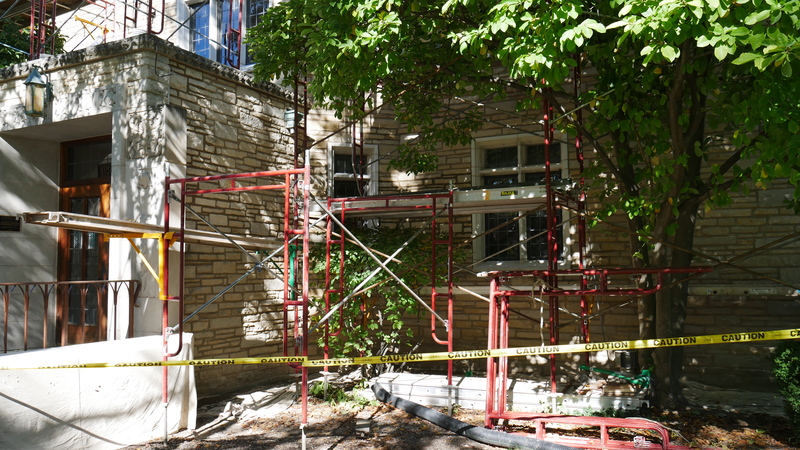 We have also reset coping stones on west elevation of education as bedding mortar and vertical joints at the limestone coping stones on the west elevation of the education building had become deteriorated and were beginning to heave the coping stone posing a life/safety hazard. Yet, we have restored the statue by binding all loose pieces and filled all gaps with restoration mortar. All of the mortar joints in the precast stone of the south entrance of the church had been filled with sealant, which was caused damage to the masonry. We have removed all caulk from the joints of the precast stone and repointed with lime-based mortar.